Gauge glasses were used to give visual indication of fluid levels in high pressure steam driven locomotives and plant. John Moncrieff earned the reputation of world leader in these products and hence could afford to inscribe each piece to enable the customer to be certain of the supply. An illustration of the tube fitting can be found here on Page 209 of the US agent Jenkins Bros. catalogue. Moncrieff “PERTH” Gauge Glass Tube. Sandblasted inscription on each tube ‘Moncrieff’s “Perth” Scotland’. 1933 illustration. Perth brand tubing was the cheapest and rated for up to 150 Pounds of Steam Pressure. Gauge glasses were used in steam locomotives and other steam plant. 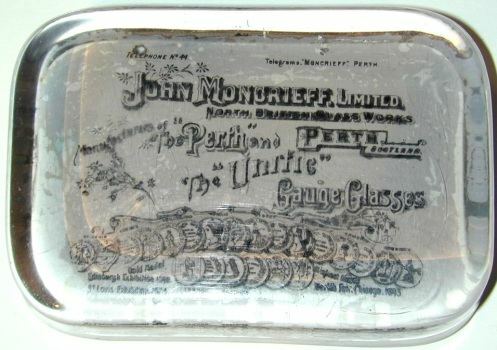 Moncrieff “UNIFIC” Gauge Glass Tube. 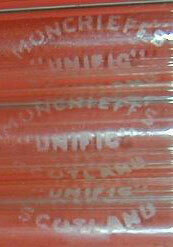 Inscription on each tube ‘Moncrieff’s “Unific” Scotland’. 1933 illustration. Unific brand tubing was about 50% more expensive than Perth brand and rated for up to 500 Pounds of Steam Pressure. 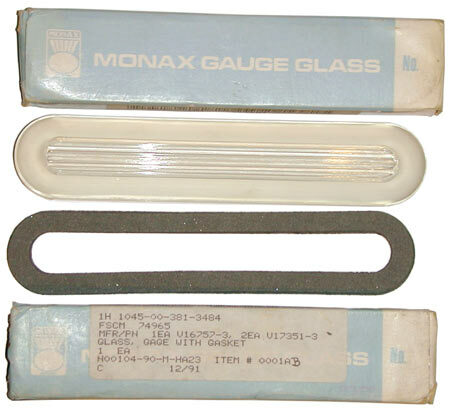 Moncrieff “MONAMEL” Gauge Glass Tube. Red enamelled stripe and the inscription on each tube ‘Moncrieff’s “Monamel” Scotland’. 1933 illustration with added colour. Monamel brand tubing was the most expensive and rated for up to 400 Pounds of Steam Pressure. Why would this be selected over Unific? Inscription on each strip ‘Moncrieff Scotland’. 1933 illustration. These strips were sold in a variety of sizes but also to specification either with prisms (top) or without. Asbestos fibre gaskets and pads could also be provided to match. They were mounted as a window to view the guage tube behind and intended to protect the users if the gauge glass exploded. Moncrieff Glass Panels or Protector Slides. Inscription on each strip ‘Moncrieff Scotland’ — ‘Specially Toughened’. 1933 illustration. Made from a specially toughened glass, these were mounted as a window to view the guage tube behind and intended to protect the users if the gauge glass exploded. The top two tubes are each sand blast etched ‘Moncrieff’s “Unific” Scotland’. The tubes are 16 inches long (407 mm) and in two diameters 3/4" (19mm) and 1/2" (12mm). The ends are fire finished. The lower greenish tube is “Perth” Gauge glass bearing a Rogers label, presumably as it was cut to size for an order, the ends are not fire polished. The large label was applied to bundles of 6 Unific tubes that had been wrapped in brown paper. The small fragment must have been a label for one of their agents, probably H A Rogers, USA. The label used for ‘Unific’ in the UK was blue and would not have used the word ‘Scotch’. The Perth tubes wrapper had an identical white label. Moncrieff supplied tubing to agents in six foot lengths the agents then cutting to the final size. I presume they were supposed to mark and not just label cut lengths! The Unific tubes fluoresce a watery orange colour under both long and short wave UV. The “Perth” tubes do not fluoresce. Quality of wrapping and labels suggest 1930-1950, but these were in production for a long time. ‘Monax’ brand gauge glass panel with prisms. Obviously from the modern period but no post code showing so probably pre 1980. The two supplied gaskets/pads are not asbestos as mentioned in the 1933 catalogue. 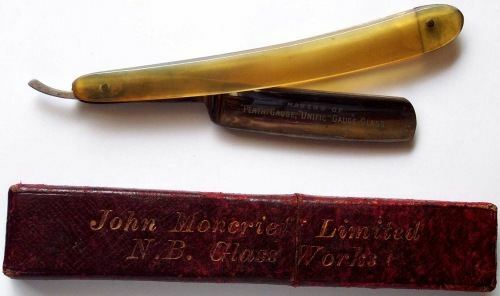 Raised text ‘Moncrieff’s Genuine Glass Tubes’ on one side of the handle and ‘H. A. Rogers Sole Agent For U.S.’ on the other side. Moncrieff advertising paperweight. This shows a number of the medals won at various international fairs. ‘MAKERS OF “PERTH” GAUGE, “UNIFIC” GAUGE GLASS’. “‘John Moncrieff Limited - N. B. Glass Works’”.